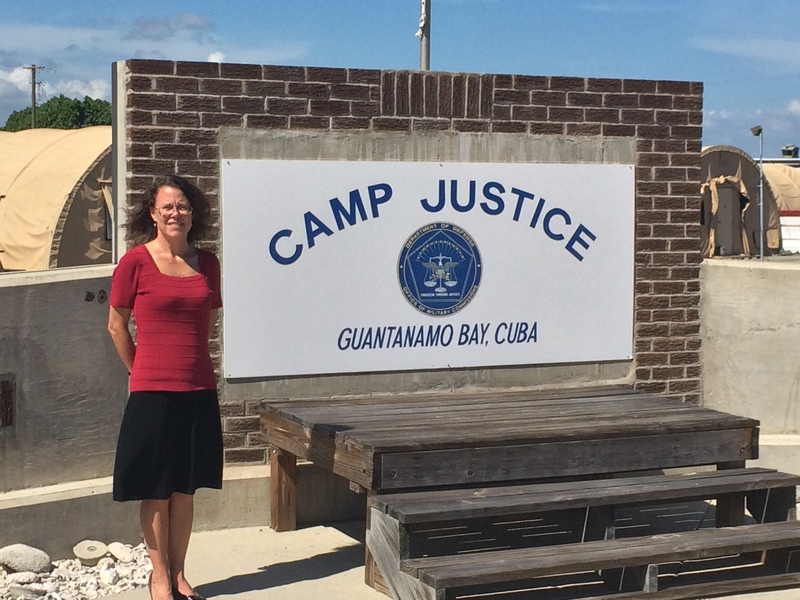 Hattie Harman at Camp Justice, Guantanamo Bay, Cuba. This morning proceedings commenced in the pre-trial hearings in the government’s case against accused war criminal Hadi al-Iraqi. Hadi is charged in a non-capital case with several crimes arising out of his alleged involvement as an al-Qaeda commander in Afghanistan. I watched the proceedings from an observation gallery at the rear of the courtroom which was separate from the main courtroom, but allowed clear visual observation of the entire courtroom through thick glass windows. Audio speakers in the observation gallery conveyed the sound of the proceedings to the observers, with a 40-second delay to allow for censorship of any unintentionally disclosed classified information in the courtroom. No such censorship occurred today. But we thirteen NGO observers were “joined” in the gallery by six uniformed military security persons. Whether the executive branch or the DoD exerted any “unlawful command influence” regarding the timing of the referral of charges against Hadi. Curiously, in the view of the defense, Hadi was charged on the Monday after the Friday, May 31, 2014 media coverage of the release of Bowe Bergdahl in exchange for five Guantanamo detainees. Whether Hadi’s charging document properly included numerous “common allegations” preceding the charges themselves. These allegations, the defense argues, are simply another mechanism to try to get unproven “facts” before the Commission (MCA equivalent of a jury) before the commencement of proceedings which could prejudice Hadi’s right to be presumed innocent until proven guilty. Whether Hadi is entitled to a status determination pursuant to Article 5 of the 3rd Geneva Convention as to whether he is actually an “unlawful enemy belligerent” to whom the MCA applies. If Hadi were determined to be a POW rather an unlawful enemy belligerent, the MCA would not provide personal jurisdiction over him, which in theory would mean he would have to be tried in a different tribunal which presumably would afford him more expansive procedural rights. Great stuff! Thanks for the detail as to your physical surroundings as well as the explanation of the motions.